We had perfect weather for another hands-on workshop session March 30 at Mountain Lakes. Clark, Kim and Steven continued cutting invasive multiflora rose, privet and honeysuckle from the small valley upstream of the lakes, and Simonette and I planted seeds of cutleaf coneflower, tall meadow rue, Joe Pye, Late Flowering Boneset, ironweed, bladdernut and fringed sedge in the greenhouse. The habitat restoration is being funded by a grant from the USDA's Wildlife Habitat Incentive Program, and we're currently in hurry up mode to meet the deadline for the brush removal phase of the project. Thanks to everyone for their help. The workshops are co-sponsored by Friends of Princeton Open Space and the Whole Earth Center. I had assumed that, because skunk cabbages smell bad and mimic the color of rotten meat, that their flowers catered only to flies. But two weeks ago I happened to peer into one and found a honey bee collecting a major load of pollen. A fascinating description of skunk cabbage's central heating system and unusual root characteristics can be found at the Wikipedia website. We had a good workday on the 16th at Mountain Lakes. Russ went after more multiflora rose and I planted 15 elderberry "live stakes", using the thickets of previously cut rose and privet bushes to protect the elderberries from the deer. Spring is bursting out here and there, in subtle prelude to the full unleashing of flowers. These crocuses are celebrating their liberation from English ivy, which happened last year (see last year's posts for easy ivy removal). 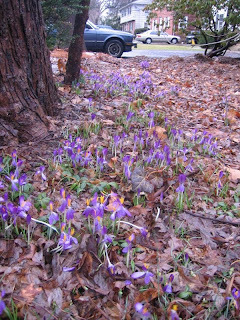 Other non-native annuals like snowdrops and aconite have also been blooming for weeks. Native species blooming this time of year are more understated--nature without makeup on. 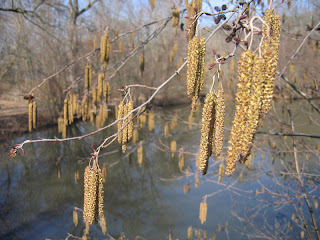 These are the catkins of alders lining Pettoranello Pond. Look up at the street trees, and chances are you'll see the reddish haze of tiny maple flowers. 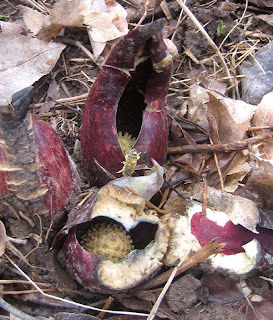 The skunk cabbages at Mountain Lakes are putting a call out to all flies for pollination services, as the spring peepers offer up eerie, spontaneous, mass orchestrations of primordial mating calls. There was even a V of geese flying north today. Thanks to yesterday's habitat restoration session at Mountain Lakes, the invasive shrubs are less legion, and some thirty new native shrubs now have a foothold in the valley just up from the lakes. 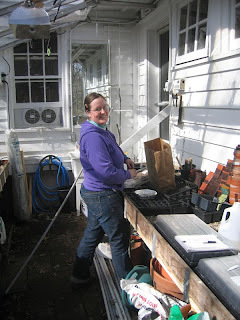 It was a beautiful, sunny afternoon for working outside. The high winds left over from yesterday's storm front sailed high overhead. We lopped the invasive bush honeysuckles and multflora rose bushes off at the ground, pulling many of the smaller honeysuckles completely out by the root. The more massive invasives were left in place as nifty protective cages into which we could plant the native shrubs, which took the form of live stakes. A live stake, as I never tire of explaining because it's such an elegant way to create new plants, is a two foot cutting taken from a dormant, fully grown shrub. You then stick the bottom end into the soft late-winter soil and cut off all but a couple sets of buds above ground. Then wait for spring, when roots form below ground and leaves above. It would be highly convenient if all native shrubs were so cooperative, but only three species root on their own in this manner: silky dogwood, buttonbush and elderberry. All three can be found growing in the wet ground along streams. We planted the first two kinds. Thanks to Clark, Steven and Annarie and her two children for their help and good company. Another session is planned for this coming Sunday, March 16.